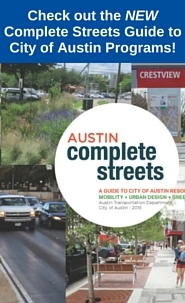 In June 2014, Austin City Council adopted a robust Complete Streets Policy. It helps to realize the community’s Imagine Austin Comprehensive Plan vision for a healthy, green, vibrant, compact and connected community. Read the policy here. Complete streets are safe, attractive places for people. On busy roads, they include sidewalks and bicycle routes. On quiet neighborhood streets, they may feature leafy shade trees and lower traffic speeds. As public spaces, complete streets are inviting and accessible places to walk, bike, or ride for people of all ages and abilities. Every year, the City of Austin and its partners add miles of bicycle lanes, protected bicycle facilities, sidewalks and other pedestrian safety features,, accessible transit stops, street trees and other green street and streetscape improvements. 1. Serve all users and modes. 2. Require connected travel networks. 3. Are beautiful, interesting and comfortable places for people. 4. Require best-practice design criteria and context-sensitive approaches. 5. Protect Austin’s sustainability and environment. 6. Include all roadways and all projects and phases. 7. Are the work of all City departments. 8. Require appropriate performance measures. 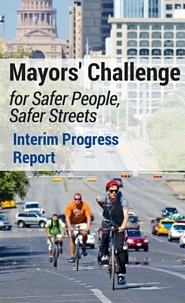 The Complete Streets initiative is led by Austin Transportation Department. To learn more about the benefits of Complete Streets, visit the National Complete Streets Coalition. Apply for a Sidewalk Cafe Permit!